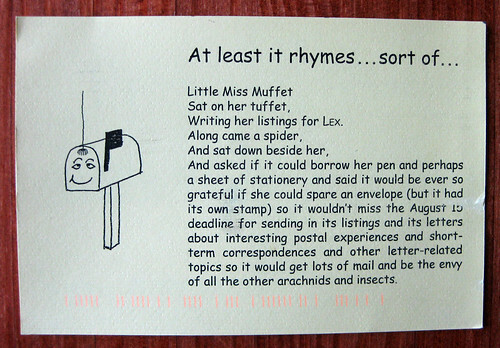 This very cute postcard came in the mail last week to remind me that the listing deadline for The Letter Exchange (LEX) is right around the corner on August 15. I love how fun and personal this organization is, from the spider hanging down by the mailbox to the text of the postcard (which you can view large, or I'll type it out at the end of this post). If you're thinking of joining LEX, this is a good time to do it. I am fairly certain the listing deadline is one of a postmark, so you can turn in your Listing Form right along with your subscription, and as long as they're postmarked August 15, your listing will make it into the autumn issue, which mails around October 15. I know, I know, it's kind of a long wait - but it's snail mail! That's what it's all about! Writing her listings for LEX. And asked if it could borrow her pen and perhaps a sheet of stationery and said it would be ever so grateful if she could spare an envelope (but it had its own stamp) so it wouldn't miss the August 15 deadline for sending in its listings and its letters about interesting postal experiences and short-term correspondences and other letter-related topics so it would get lots of mail and be the envy of all the other arachnids and insects. EDIT on 8/6: I forgot to mention other option, which I should have mentioned in the post: you can buy a back issue and still write to listings to have them forwarded, you just don't get a member number and therefore can't have the free forwarding service work for YOU. Single issues are $9, and of course there's no deadline for that. I actually got a letter recently from someone who did this. I recieved the same reminder from the Letter Exchange and it is cute but I simply am not going to resubscribe to it. My intention was to try it again for one year and find some new pen friends of which to communicate to and I might have able to relate to better and have more common with than I do with my neighbor across the hall etc. Sorry you feel that way, Tascha - LEX certainly isn't for everyone. I think that LEX is great! Certainly not every listing will appeal to you. Certainly not everyone will write back. On the other hand, LEX is where I have found some of my very best friends and most stimulating correspondents. I would recommend placing some very specific inserts: "I love HAMLET and THE MAGIC FLUTE and tales of the South Pacific" or "Pittsburgh Penguin Fan" instead of the more generic: "Fill my letter box" or "Send me a letter!" I don't know what I would do without my LEX friends. They are all more compelling and alive to me than many of my actual family members. SLR, I totally agree with you about placing more specific listings in LEX. You'll get a more precise match to you and your own letter-writing habits - I've had exponentially better luck with my more specific listings than my first, general one. Thanks for the reminder; I'm still not sure whether or not I want to fork out the money for it. I guess I'm still insecure about whether or not I'll keep up with letter writing, and don't want it to be a waste of money. I'm so curious about this magazine though. And yet there's tons of ways to get penpals online. Decisions, decisions. Well, the other option, which I should have mentioned in the post, is that you can buy a back issue and still write to listings to have them forwarded, you just don't get a member number and therefore can't have the free forwarding service work for YOU. Single issues are $9.